ohwhyelle – Looks right, but it ain't right. I have created an infographic below to highlight the key points that this module has taught me. Before this module I thought of myself as a ‘digital visitor’ but right now, I see myself as more of a ‘digital resident’. I have learnt the importance of building an online professional profile by seeing yourself as a brand. This module created a sense of community on WordPress by encouraging us to comment on each other’s blogs. It was an eye-opener to read and discuss with my classmates on various topics. Everyone has their own interpretation of the topics; some were insightful while some were thought provoking. Regardless, I think we all certainly have learnt something from one another. Overall, this module had given me an invaluable learning experience. Taking this knowledge forward, I intend to continue building up my professional profile whilst keeping it authentic, and be wary of social media ethics and what I post online. I also hope to continue blogging (not everyday), by choosing to articulate the most meaningful events and the most important thoughts, and hopefully I can add this to my LinkedIn profile to assist my future employment prospect. I have never thought I have taken open access to online materials for granted before reading the advantages and disadvantages of this topic. Nicole’s post mentioned that copyrights issues is one huge issue that deters content producer from providing free content. The lack of initial payment as well as the risk of plagiarism, misrepresentation, misuse, and misquoting demotivates authors to provide free content. Jun Ning’s post has shown statistics that many people are willing to watch advertisements to avoid paying. Personally, I would watch a minute long advertisement rather than paying to enjoy ad-free content. Therefore, I think this is a great way for content producers to earn some profit by working together with marketers or advertising agencies, while still providing free content for visitors. Upon commenting, I was also asking myself why am I unwilling to pay? Is it because I could not afford it, or the content is not worth the money? Based on my further research, younger and more frequent visitors are usually the ones that are unwilling to pay. The most common reason is simply because the site did not provide a good enough explanation on why the paywall is initiated. In the New York Times paywall case study, it has suggested that readers are more likely to pay for the content if they think the request is a fair one. For example, letting the audience know the New York Times is likely to go bankrupt without digital subscriptions. This video below details the New York Times paywall case analysis. In conclusion, it appears to me that publishing a work online is really competitive and it takes a lot of hard work. Especially for creative content producers who often want to attain higher level of needs (reputation, recognition), while satisfying their basic needs (food, water, etc.). I feel that in this digital age, content producers need to embrace open access and develop new mechanisms to benefit from their work. Find my first comment and second comment here! It was enlightening to read on various ethical issues raised by educational and business use of social media through my colleagues’ blogs and because this topic is so broad, I have decided to focus on the business’s side of social media ethics. Constance’s post has covered on the risk of employees inadvertently disclosing information about their company through the use of social media. Her embed video has shown a good example upon how a single photo with the background of an unreleased new product can affect the company’s competitive advantage. ‘Freedom of speech’ can be applied when you’re talking about expressing your feelings about work or your supervisors. However, we should be mindful of what we post and be accountable to it because as an employee, you’re still representing your company and one single comment can have a significant negative impact. In order to prevent this from happening, it is best to train employees about disclosure and have a clear policy in place. Clinton and Junwai’s posts discussed on the ethical issue of unreported endorsement. I agree with them that it is unethical to buy ‘followers’ and ‘likes’, as well as paying bloggers to write positive reviews. Junwai believes that companies who resort to such acts are usually start-up companies that wanted to ‘look good’, while I believe it is mostly finance orientated companies where their main focus is to earn profit, resulting in poor strategic decisions. Nonetheless, the successes are usually short-lived, it is definitely unwise for a company to use such tactics if they want to stay in the long-run. In conclusion, you can’t exactly stop anyone from posting what they want online but you can reduce the risk through avoiding unethical behaviours on social media by staying true to yourself and your business. As discussed previously in topic 2 and 3, authenticity is the key in the digital world. Reputation is built on trust, which takes time to build and not by the amount of followers or likes on social media! Have you ever got so annoyed from receiving notifications of game requests or invitations from your friends on Facebook, but then realise it wasn’t them who are sending it to you? It was automated by the game itself. In this digital age, social media is seen increasingly prominent as a marketing tool in reaching out to larger target audience. The data available on individual consumers is a resource that companies are understandably trying to mine. If used properly, it’s a win-win. Consumers get better, more relevant offers and brands waste less on poorly targeted advertising. However, there’s a line past which using information means violating privacy. Many social media outlets’ operators are well aware that their profits may increase as we expand our willingness to share our personal information, and much of the business model development for social media sites is designed to trick, taunt, or tease us into revealing more information about our lives and our thoughts and opinions. Who are your friends? What are your interests? What is your relationship status? Who do you poke? Your friends have downloaded our app. Why won’t you? Some games on Facebook demands access to private information before allowing user to play, as well as making users agree to their terms, giving app developers permission to release information about you and potentially minors and personal relationships with people who are not even playing the game. This is done to induce more players but it can backfires as people who are not interested in the game do not appreciate it, and players might end up quitting the game after receiving negative feedbacks from friends. Facebook has also stepped on the privacy land mine numerous times by repeatedly changing the types of personal information automatically shared. Read more here. In addition, in late December 2012, Instagram caused an uproar in the Internet over the change that appeared to allow the site to sell users’ photos to advertisers. Read more here. Thus, even when these breaches are unintentional and not malicious, they scare user/consumers away. In conclusion, with big data, comes with big responsibility. It is a skill to use and manipulate the new technology to our advantage to gain more profit for the business, but you can’t do that if the user/consumers are leaving. With trust being the prized currency of social media, ethical lapses or oversights can be deadly for brands. As customers are one of the business stakeholders, the last thing you want to see is people using social media to talk about your brand negatively. Initially, I wanted to cover all the steps or criteria on how to develop an authentic professional online profile but I soon realise it was unrealistic to fit all in under the word count. I had quite some difficulties doing this topic because it was very much interlinked with topic 2. There are many information overlapping and I find it hard to properly sort out my thoughts. Nonetheless, through this topic, I think I have a much better idea on how to develop an authentic professional online profile after reading various blogs. However, I came to ask myself these questions: How do we ‘keep it real’ when we are slowly living in the web where having multiple online identities is common, and how can we keep a competitive edge in this ever changing world? Globalisation has impacted us in complex ways and forces us to constantly re-think and revise our sense of identity and place within society. The key is to explore and understand our own and others’ identities. We can develop authenticity by being real, charitable, consistent, responsive and etc. Read more here. Furthermore, constantly worrying if you will be judged by the content you want to share online can be quite burdensome yet essential as well. Remember, quality over quantity. Therefore, we should be mindful to present our offline and online profiles as close as possible to increase authenticity. No matter what, people do judge as it is a natural way of labelling/remembering things and creating false information is tiring! Overall, this topic made me learn that we shouldn’t be passive to the changes of technology but to be proactive in taking advantages of what have been changed. I remember my mum once told me that if you can’t change something, then try changing your mindset first! 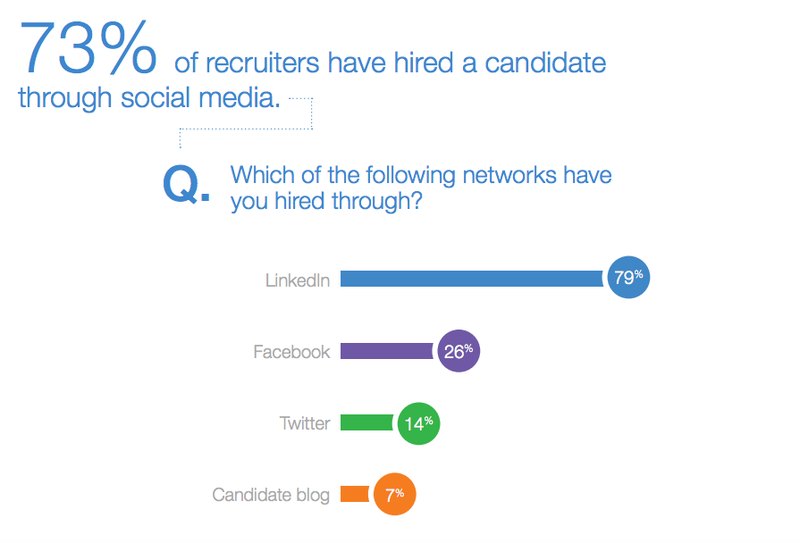 As the world we living in is becoming more technologically driven, social media recruitment is significantly more important. Many employers now are looking at the public profiles of applicants before hiring them to get a better idea of their character traits. This means that you should be building your profile (brand) in these social media platforms shown above to increase the chances of getting employed, and remove anything that is inconsistent or inappropriate. Based on my own understanding of an authentic professional online profile, it is a genuine and original profile that represents you. So how do we create an authentic and appealing profile? First of all, you need to start thinking of yourself as a brand, which requires you to ask yourself a series of questions like: What do people think and feel about me? Is it positive or negative? It is important to work it out and find out what makes you, YOU. Here’s a short video on 5 easy steps to create your personal brand. As seen in the video, in one of the steps that Amanda has listed is to determine what is your passion. It can be a hobby or anything that you feel passionate and committed to regardless it being related to the industry you intend to enter. Showing consistency towards your passion can also increase authenticity. For example, keeping a fashion blog updated every month for 5 years shows you have genuine long term interest. Marketing ourselves professionally online echoes back to the idea of managing our online presentation and reputation as mentioned in Topic 2. It is essential to manage our own personal brand effectively to present the best side of us, so be wary of what you choose to share online. Take a look at how these 5 people got fired from social media. In conclusion, there are countless way of developing an authentic online profile but just a few has been discussed here due to restrictions. Ultimately, social media can either support your personal online brand/professional identity, or hinder it. My advice would be to pay attention to the details and realise that nothing is ever really private. If you manage your “branding” of your online identity correctly and your privacy settings properly, you practically have nothing to worry about.